This section of the site provides you with lawn care advice and several lawn care tips which should help you in the routine maintenance of your yard. Lawn care covers topics such as mowing your grass, watering your lawn, and fertilizing your grass. It should be mentioned that the grass guides will provide some very detailed information about many of the same subject but targeted for your particular type of grass. Whack a Mole! Get Rid of Moles in Your Lawn. 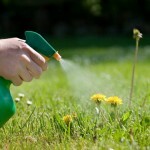 Are Organic Weed Killers Really Worth the Extra Cash?